Discoveries that can change your life are all around you and in the most unlikely places, but beware of coveting someone else’s. 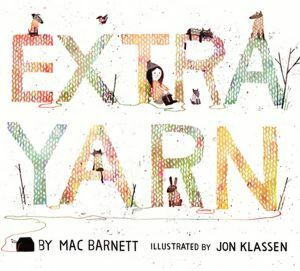 Mac Barnett and Jon Klassen tell a simple tale with many lessons in their picture book – Extra Yarn. Resisting ridicule and bribes, Annabelle creatively uses a box that never runs out of yarn to renew herself, her family, friends, and the town. She understands the value of the box beyond money, and the box stays faithful to its owner. With the same simple drawings he used to illustrate I Want My Hat Back, Jon Klassen transforms a dark icy scene into a knitter’s paradise. This entry was posted in reading and tagged Annabelle, Extra Yarn, Jon Klassen, Knitting, Mac Barnett, Picture book, Yarn. Bookmark the permalink.